This has been a very busy week in the house. With our occupancy scheduled for November 27, a week from today, the trades and other workers have been scrambling. Yesterday, four trades and several other workers were all over the house and delivery trucks were coming and going, making for a very crowded driveway. The electricians, plumbers and furnace guys have almost finished their work. The plumbers thought that the water would be working by this afternoon but something went wrong and we have to wait until next week for that. Visually, the biggest change has been the installation of (most of) the kitchen. More needs to be done, but it is taking shape. 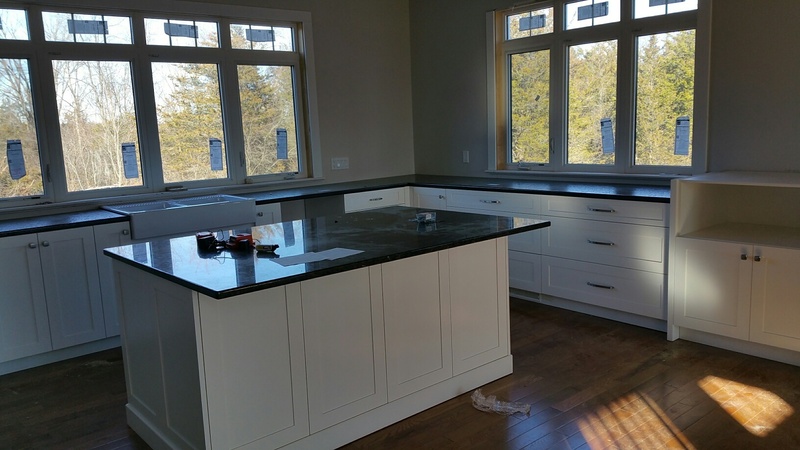 Yes, we have lots of counters and lots of windows in the kitchen but no upper cabinets on two sides of the U-shape. The left hand (west) side of the kitchen is a bit more traditional, with upper cabinets. 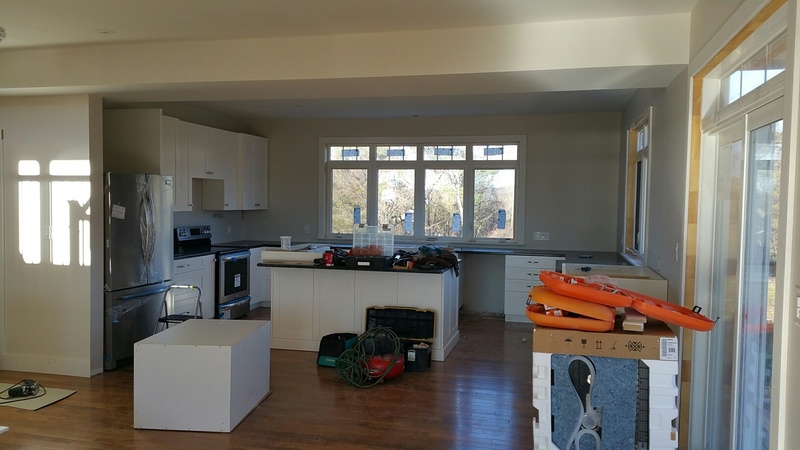 But, for the most part, we wanted a very open kitchen with lots of work space for family and other gatherings. Next week, we are promised, the siding goes up on the exterior and a thousand and one details need to be taken care of inside. We have some more work to do ourselves; caulking and painting the interior window and door trims and installing the floor upstairs. But we have decided that those can wait until after we have moved in. We are busy enough these days and the house is too full of other workers for us to be there too. We are considering doing a “staged” move-in, starting next weekend, enough for us to be living there, but not completing the move for about a week. About half of our furniture and things are currently in the cottage basement and about half is in storage in U-Boxes in Belleville, about a 45 minute drive from here. So exciting!!! Love the big windows!!! The kitchen is looking beautiful. I love the windows! You must be so excited to be this close to moving in. Exciting…and lovely..wonderful light in the kitchen! Wow! Looks amazing! You must be pretty excited; I know I am 🙂 A ‘staged’ move-in sounds very practical and much more relaxed.